All around me. I find inspiration in nature, in architecture, in special places, in mythology…really, I can never tell. 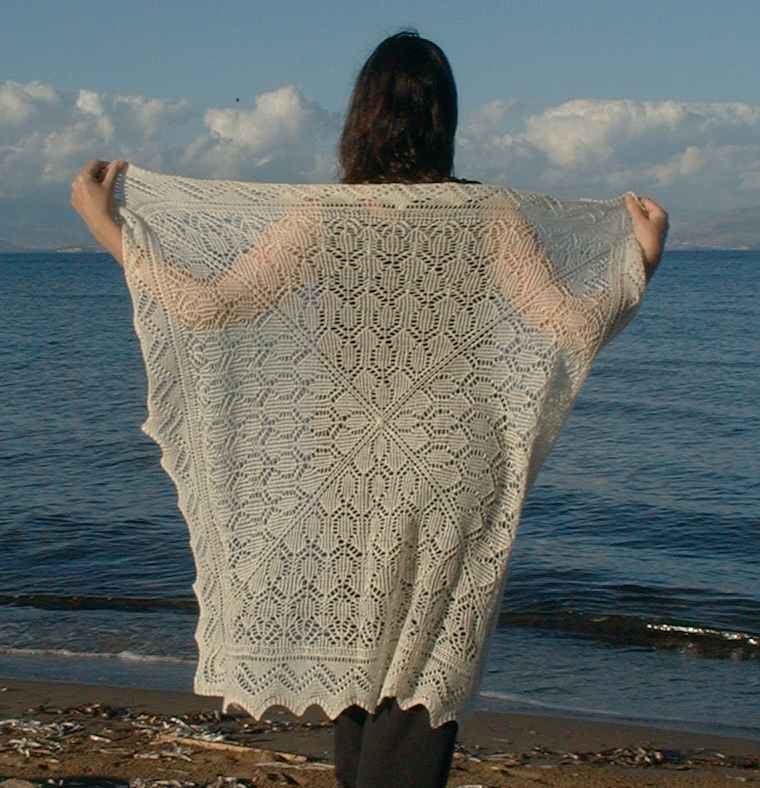 Sometimes a place captures my imagination, and a project come out of that, like my Corfu Shawl. When I travel the scenery, the light and the colors might inspire me. My Diwali Wrap is very much inspired by color and light. Lace. I am all about knitting lace. Most of my pieces are “one size” but I often build in potential pattern repeats so that it can be sized up if the knitter chooses. I like to look through all the knitting magazines to see what is getting published. There are a few lace designers who are doing unique things, and I like to follow their work. I am not worried about being influenced by someone else’s work. I don’t like to repeat what has already been done well, and I have so many designs in my head at any given time I almost never knit anything but what I am currently designing. This is really not on my horizon. I design because I have to, for me. That means that as long as I can document the process clearly enough for another good lace knitter to follow me, I am happy. I also do some work for yarn companies, which I try to keep within the context of their publishing guidelines. That could mean just a few pages of directions and maybe only modest charts. I consider that “keeping it simple” rather than “dumbing it down.” I understand that 8 large charts just might not be in keeping with a yarn company’s pattern printing budget. I knit all my own samples, because I like to knit through my charts before I subject anyone else to possible glitches. I do have several wonderful lace knitters who often test knit for me. I try to give them a full pattern, as print-ready as possible. They knit the piece from that and give me feedback on both the directions and the charts, and between them they usually find any errors that slipped by me. No. I have an informal business plan, and it is a little amorphous, but essentially I want to be able to justify the time I spend knitting so that I do not feel guilty when I think I should be cleaning my house…and these days I am able to do that. No. I am mostly self taught. The internet has made my business possible. Half of my sales are from electronic sales of patterns on the internet. It has been a wonderful way to connect with people. I have been hosting two large group projects a year and there are knitters from almost every continent who participate. It is really wonderful how small the internet has made the knitting world. I have a family, an old house, a more than full-time career in health care and I knit. It is the knitting that keeps the rest of it in balance. Gorgeous lace! Andrea is a treasuer. Andrea's lace patterns are so beautiful! It's exciting to see how each one evolves and what new elements she has added to each pattern. I make it a point to work on one of Andrea's designs every day - in fact I'm kind of addicted to them. Knit on Andrea! Thank you for a fascinating glimpse into the process of one of our best lace designers working today! Andrea's elegant, innovative and beautiful designs are a pleasure to knit and we are so lucky to be able to buy her patterns! I always learn something wonderful by knitting something she designed.